Adventure Stage Chicago’s youth mentoring program, the Trailblazers, presents the premiere of "Stuff: A Curious Collection," created in collaboration with playwright Sandra Fenichel Asher. The free, hourlong all-ages shows are at 7pm May 20 & 21 at the Vittum Theater, 1012 N. Noble St. They're followed by snacks and interactive theater games. To reserve seats, call 773-342-4141 or visit adventurestage.org. "Stuff" uses sound, movement, music, poetry and dialogue to capture the magic in things we come into contact with everyday. 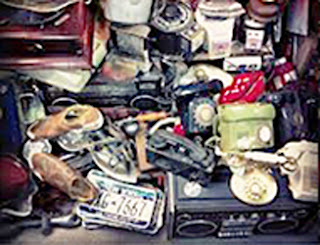 A license plate, a doll, a steering wheel, a stethoscope -- each object contains amazing tales of the world and people around us, including ourselves. The Trailblazers works with select youth ages 12-15. The program began with each “junior” participant being paired with a teaching artist. These pairs met as a small group throughout the summer of 2012 to build ensemble and develop interview skills. Towards the end of the summer, the group began to interview one another on a one-on-one basis. In addition, they explored ways to devise performances on their own and partnered with the Wicker Park and Bucktown Chamber of Commerce in August 2012 to perform at the Polish Triangle. Asher worked with the Trailblazers on a piece based on interviews conducted with the group and other West Town community members. She led a writing workshop and continued to work with the Trailblazers via Skype and videotaped interviews, group exercises and experiments. The Trailblazers program is made possible through a Continuing Innovation grant from the Doris Duke Charitable Foundation and represents an important step in Adventure Stage's integration of social service delivery and artistic practice.